Julian Stubbs is founder and CEO of UP THERE, EVERYWHERE the world’s first global cloud based agency. He travels about 120 days a year and is a public speaker on a variety of subjects. More on Julian at www.upthereeverywhere.com or go to You Tube for some of his presentations. All of us at some point in life have to stand up in front of other people and make some sort of presentation. That’s just the way it is. Whether it’s only a verbal presentation to a few people or a Ted Talk with cameras and a larger audience, there are some simple things to remember that will help you make as strong a presentation as possible. Ok, you’ve just been invited to make a presentation and the fear starts to set in. Well, don’t panic. According to my Myers-Briggs Type Indicator, I’m a 100% confirmed introvert, so not someone who naturally enjoys public speaking. However that doesn’t necessarily mean I can’t stand on a stage and give a speech—in fact I’ve done it hundreds of times and have survived, and so can you. The most important thing is to prepare correctly, practice and then stick to a few simple rules. These are the focus of this blog. They are the rules I’ve lived by and they seem to work for me. 1. Don’t reach for a computer right away. My first rule is don’t reach for the computer first. Plan in analog. Get a plain sheet of paper or better still, a large flip chart, and map out what you want to cover in your presentation. I’m a digital nut, but the computer can come out later as you start to build the actual slide deck. 2. Don’t start with detail – start with an idea. The most important part of any speech or presentation is an idea, not detail. Detail is there to support the idea and I see too many people who think that just simply presenting lots of data and facts makes for a great, engaging, presentation. It doesn’t. It starts with a good idea. 3. Don’t focus on too many things. The rule of three. A presentation is a story, so think of it that way. You are telling a story and like all good stories there is a beginning, a middle and an end. Build three parts to your presentation and start to decide how you will structure it into these three sections. Doing this makes it much easier for the audience to remember the salient points and helps them structure in their own minds what you are talking about. 4. Don’t use bullets on slides (repeat this statement 10 times). 5. Don’t talk about what you want. Talk about what your audience wants. Any good presenter knows that focusing on what the audience wants to get out of it is key. Always get advanced information about your audience, and put yourself in their shoes. Try to imagine what they want to get from your presentation and what is going to make it a great presentation from their point of view. There will be certain points you need to cover, so think about where you will cover these in the presentation, and the evidence and facts you have to support these points. 6. Don’t discombobulate (don’t use difficult words). A common mistake I see in presentations is that people use overly complex or obscure language. It just confuses people. One way of getting an audience to remember your presentation is to use simple everyday language and powerful big numbers. Use fun and interesting words that add that extra punch. Too many business presenters hide behind complex terms and phrases, and this doesn’t help their presentation or get the audience to engage with it. When using numbers, keep it simple and add context so the audience can better understand what the numbers mean. I recently gave a Ted talk about the benefits of remote working and working from home, and wanted to talk about how much time I used to waste every day that I sat in a car. I didn’t just want to state the number of hours per day, which was 2 hours per day. I wanted to really communicate what that meant in context. So I talked about the 18 days a year I was wasting, which is equivalent to more than a two-week holiday. Give your numbers a human scale. 7. Don’t just hope it will be all right on the day. Practice! We all know that practice makes perfect, and this is never more true than when it comes to making a presentation. Once you’ve got your draft presentation ready, rehearse with yourself and talk it through. See if the words come out easily and where there are complexities you need to navigate. I tend to practice talking out loud and even time the presentation. Whenever I start practicing a new presentation, it sounds awful – but that’s why you practice! I then typically ‘rehearse’ parts of my presentation in conversation with friends to test out my arguments to see if they hold up under discussion. Finally, I run through the whole presentation with close friends, or my wife, who can give honest, critical, feedback. In the TedX speaker’s guide they list the most important elements in making a great Ted talk. And top of the list is rehearsal. So know your subject and rehearse, rehearse, rehearse. 8. Don’t just assume…check the technology. My biggest actual fear in making a presentation is technology not working. So I always check that the technology works. Confirm that the films play, slides animate correctly, and sound is working. Don’t just assume it will work. Have a run through: check the projector, and that the slides look good, check the sound system if you have one as well as any other technology like remote controls or pointers. And even once you have done all that, be prepared for disaster. I’ve been in those situations. Once I was giving a presentation in Phoenix, Arizona, to around 250 people and, despite there being two technicians present, the computer system crashed as I walked out on stage. (They were using a PC running PowerPoint. Since that day, I have always insisted on using my own Apple Macintosh computer running Keynote as the presentation program). But in spite of the technical issues, I managed to cope as I had prepared for a verbal version of the presentation using notes I’d written on cards – just in case. I keep the cards tucked away in my pocket as a final back up. So never assume everything will just work. 9. Don’t keep looking at the slides, your finger nails or your laser pointer or anything else except the audience. One of the worse nervous habits some people have is to stare out into space or at anything except the audience. One very senior executive I know has the habit of examining in detail the remote control in his hand to avoid making eye contact with the audience. So, look the audience in the eyes and don’t even look at your own slides. It will make you look awkward. Know you material well enough to make eye contact with your audience and engage them throughout. Even try to build in some two- way dialogue where possible with your audience. 10. Finally – you don’t have a Boa constrictor wrapped around you. So breathe! Boa constrictors kill their prey by wrapping around them and squeezing tighter every time their prey lets out a breath Some people, when they’re presenting, seem to have the same problem. So don’t forget to breathe! Before you walk on stage or stand up, take a couple of good deep breaths and compose yourself. When you are talking, take a moment every now and again and make sure you are not rushing. Slow things down – it’s not a race. Even when giving a Ted talk, and the 18-minute clock is counting down in front of you, remember to take pauses. It allows you to breath naturally. Pace is so important. Taking those pauses makes you look more in control and confident as a speaker, and lets you breathe. If it’s a larger audience, say over 200, try to pick out a few people around the room to use as focal points, covering all areas of the audience. It helps make you look more animated. So those are my personal ten important points to consider when giving a presentation. 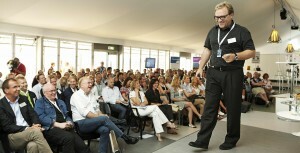 And remember, most people in the audience want you to give a great presentation – so they are sympathetic. Smile, be yourself and genuinely engage with them on a human level. They will appreciate it. Good luck!